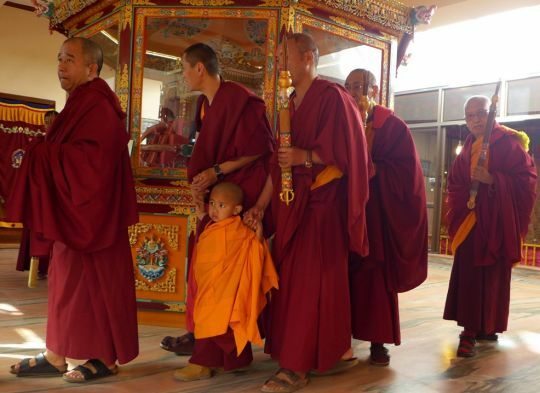 Preparing for the enthronement: Thubten Rigsel Rinpoche, Lama Zopa Rinpoche, and Khen Rinpoche Geshe Chonyi at the beginning of the ceremony, Kopan Monastery, Nepal, March 6, 2017. Photo by Laura Miller. Monday March 6—today—is the start of the enthronement celebrations for the reincarnation of Kopan Monastery’s beloved long-time abbot, Khensur Rinpoche Lama Lhundrup. 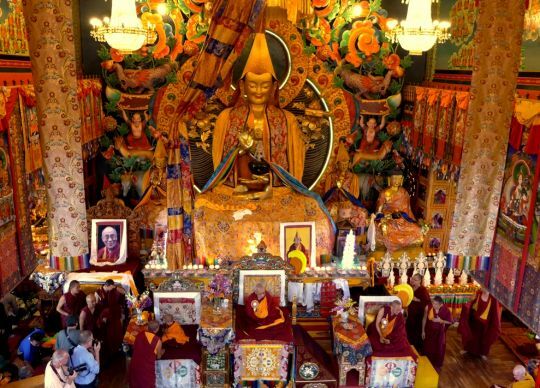 The official enthronement of Thubten Rigsel Rinpoche took place this morning (Nepal time) in the main Kopan gompa, festooned for the occasion and presided over by Lama Zopa Rinpoche and other lamas. Khensur Rinpoche Lama Lhundrup arrived at Kopan Monastery in 1973. He was “mother, father, teacher, friend” to the monks and nuns of Kopan, as well as to many Western and Asian students, and he oversaw the growth and development of the monastery and nunnery for almost forty years until his passing in 2011. Monks from Kopan’s tantric college began the auspicious day, blowing their long horns in the early morning. 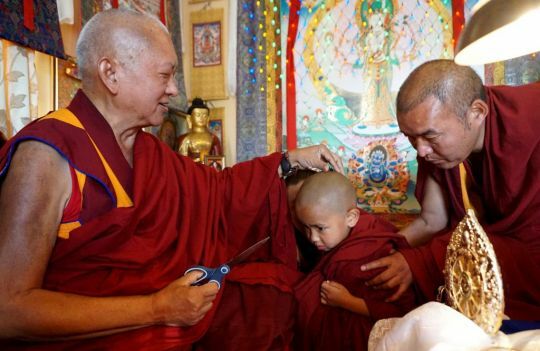 Then Khen Rinpoche Geshe Chonyi, Kopan’s current abbot, and others escorted the young Tenzin Rigsel Rinpoche up to Lama Zopa Rinpoche’s room for the hair cutting ceremony, when his name was changed to Thubten Rigsel Rinpoche. The hair cutting ceremony, Kopan Monastery, Nepal, March 6, 2017. Photo by Ven. Lobsang Sherab. Morning prayers were followed by the enthronement ceremony itself. Thubten Rigsel Rinpoche attends morning prayers before the ceremony with, left to right, Losang Namgyal Rinpoche, Ven. Ngodrup Tsering, Ven. Thubten Kunkhen (Khensur Lama Lhundrub’s attendant), Khen Rinpoche Geshe Chonyi, and Lama Zopa Rinpoche, Kopan Monastery, March 6, 2017. Photo by Laura Miller. After the ceremony, there was a long khata offering line for Lama Zopa Rinpoche, Thubten Rigsel Rinpoche, and Khen Rinpoche. 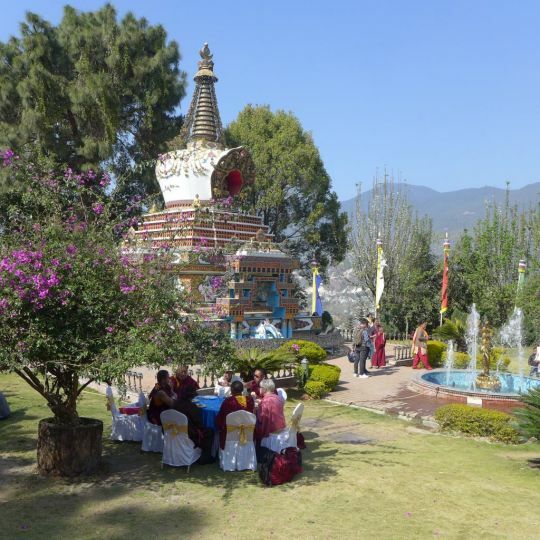 Many other lamas attended the ceremony, including Yangsi Rinpoche, president of Maitripa College; Tenzin Phuntsok Rinpoche, the reincarnation of Geshe Lama Konchog; Kundol Rinpoche; Cherok Lama Rinpoche; Lama Monlam; the manager of Sera Je Monastery; the manager of Tsawa Khangsten at Sera Je; and representatives from the fifteen Gelug monasteries in Kathmandu, Nepal. About 300 invited guests are staying at Kopan Monastery and Nunnery for the event, and more than a thousand came for the ceremony. These included large groups from Singapore, Malaysia, and Hong Kong; approximately fifteen IMI Sangha; ten FPMT center directors; and Mandala’s managing editor Laura Miller. The parents of Thubten Rigsel Rinpoche, who is the younger brother of Tenzin Phuntsok Rinpoche, came from Tsum, a remote valley area of Nepal; many Tsumpas (people from Tsum) also attended. With so many attendees, some people had to sit in the courtyard. A group of Tsumpas sit on the left. Kopan Monastery, Nepal, March 6, 2107. Photo by Laura Miller. After the ceremony, lunch was offered to all, with Kopan’s Enlightenment Garden transformed into a beautiful dining area. Lunch in the Enlightenment Garden, Kopan Monastery, Nepal, March 6, 2017. Photo by Laura Miller. 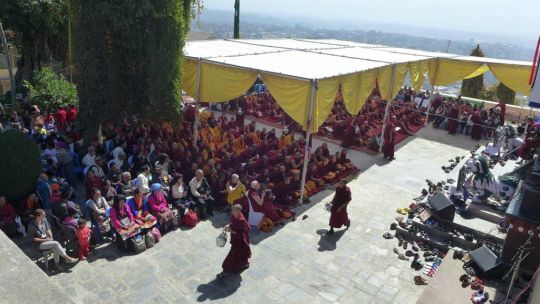 In the afternoon, there was an offering of songs and dances in the courtyard in front of the gompa, including performances by singers and dancers and lama dances by Kopan monks. 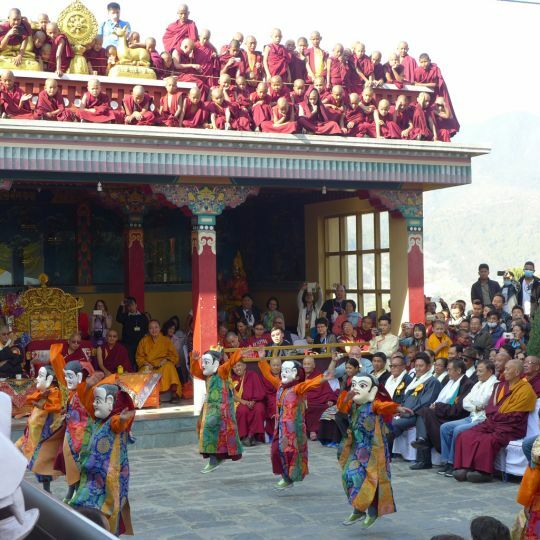 Young monks dancing during the celebrations, Kopan Monastery, Nepal, March 6, 2017. Photo by Laura Miller. The entire enthronement celebration will run for three days and include a long life initiation offered by Lama Zopa Rinpoche, the arrival of His Eminence Jangtse Chöje Rinpoche Lobsang Tenzin, a pilgrimage to Swayambu Stupa, and a special dinner at the Hyatt Hotel.